The Tamiya re-release debate is very much at the forefront of the collector community and has been for some time, so I thought it worthwhile to discuss the topic here. Before I start though I just wanted to be clear that I don't believe there is a right or wrong answer to this topic or a conclusion that we will all agree on! I'm not sitting on the fence as you will read later but I do try and understand it from everyone's point of view. I think it's like many of the big questions in life (really!?? - bear with me! ), how you feel about it really depends on your standpoint, it's subjective and based on your motivations and emotions towards the hobby. These emotions are strong for some us because the nostalgia takes us back to great times when we were growing up. It's a fantastic hobby for sure with many different aspects, people have different reasons for being part of it and I for one have been forced to really look at my own reasons for enjoying this hobby when asking myself why I feel the way I do about these re-releases. This does draw into question what we consider a re-release. 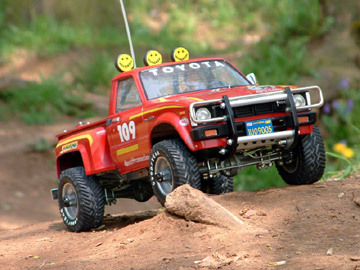 It could be argued that for example the Holiday Buggy and Sand Rover on the newer DT-02 chassis are not re-releases at all as they only have the older body and name, this is really a branding exercise to be honest and in some cases (like these) I personally welcome the move because the new model performs so much better. These are still good looking and affordable scale models which for me is welcomed in today's marketplace of generic soap dish styled lexan bodied buggies. It does pain me though that a few simple mods to the platforms chosen for these models could help preserve their scale looks. The Holiday Buggy 2010 and Sand Rover 2011 are too wide and the wheels too big, these issues could be easily resolved by Tamiya yet they seem to be lacking the motivation to design anything new for the off-road market at all and hell bent on churning out models that are a mish-mash of existing parts (Vajra!!!) or just colour variations on existing models. It seems they are aiming for "quantity" and not "quality" to me. 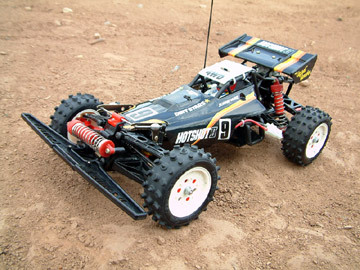 Some people really object to this idea of "recycling" bodies and chassis but this isn't a new idea, remember Tamiya have been doing this in the first 100, the Pajero for example use Grasshopper/Hornet running gear and was then jacked up to become the Lunchbox, look how many models used the Frog chassis/gearbox and even the SRB chassis was used perhaps when it shouldn't have been on the F150 Ford Ranger XLT. What a mish-mash of parts the first 100 actually is when you look at it. Audi Quattro on a Wild Willy chassis? Oh dear!!!! Looking at it logically then it seems to be all good? Well for me the answer is no, it really doesn't please me at all and it hasn't done from the very start. At first I couldn't work out why because surely the idea of a new (vintage) Tamiya kit at an affordable price should be great news? Well not really and for me it's because you end up with something that really isn't old, rare or collectible. It looks like a Frog, but it's not a Frog from the 80's is it? Perhaps I'm lucky to have scratched most of my vintage itches before the re-release frenzy but building a vintage Frog from hard to find parts collected at a great cost in terms of time and money over a period of months or even years was hugely satisfying. In addition to this I made contacts and life long friends along the way as I traded and searched for rare parts. Now though Ebay and other sites are awash with plentiful and cheap re-release parts being sold by anonymous non-collectors out to make a buck from our hobby. To see a Frog again in it's new built glory after so many years was quite something and stired up deep down emotions, childhood memories and joy, it makes you feel young again and that's very addictive! Buying a re-release Frog from Ebay and having it shipped to Japan just isn't the same I'm afraid. It makes me look at my new built vintage Frog differently too, it's de-valued financially but that's not the real problem as I don't plan to sell it but it's also taken away it's rarity in a big way. Ok so it is *truly* vintage but actually people don't seem to care about that which is evident in the prices. It's a real shame that the re-releases make me feel this way about my models but it does and I have even started looking at my other models in the same way because I know they may well end up being re-released any day now. For runners this is probably a good thing because it saves running an original, on the move it would be hard to tell most re-releases apart from the original and they normally run better due to better engineering tolerances and it makes for cheaper spare parts too, but as I say the real buzz for me is having rare models that took time, money and sweat to re-create or restore. I did succumb and bought a re-release Hotshot kit for parts on my Supershot runner and a built a Rough Rider (Buggy Champ) re-release kit which was actually enjoyable as it felt like the old days building an old kit, even the crisp box and fresh smell was like it would have been in the old days I suppose but I still look up at my original SRBs on the shelf with some sadness in my heart. It's a shame that more collectors don't value the older parts/cars more. I appreciate that for many it's just great to at last be able to afford NIB kits of cars they always wanted but it makes me laugh when people are talking about buying the new Bruiser kit at £500 - £700+ when that kind of money would buy you a vintage model that could be restored. Surely the vintage model is more to be proud of? I know I would be? It's nice to be able to say that my Rough Rider is 100% 1979 but other people don't seem to be so bothered. I don't think some of these models have been priced well and once you start getting close to vintage model prices for new kits it's not a bargain to me. I'd rather have the original thanks, something that was created in a factory last month is not worth the same to me at all. So when will it stop and what comes next? I just don't know in truth and nothing would surprise me, I do know that I have been selling many models firstly before their values crash but more importantly because I don't feel the same about them any more. Every shelf in my collection has a model on it that has been re-released now and that's something I never thought I would see. It seems that Tamiya have little regard for the collector community and are motivated by money. For them it's so easy to bash out re-releases without incurring design costs and I suppose if there's a market then why not. Perhaps they figure it's better to sell something than nothing because they don't make any money on the sale of 20 year old models. They could be forgiven if they were creating good looking modern machines but frankly they've been left behind by companies like HPI and Axial in my opinion who are creating scale realistic models with incredible performance and reliability without piggy-backing on the success and X-factor of older models which have had their day. Come on Tamiya let's see some of the design flair and magic of old. You've made such a mark on the world with models that inspired us, delivered thrills and excitement to so many of us when we were kids. Isn't about time we saw some of that originality and creativity again? Great article, and I completely agree with steve. Tamiya can't rehash the glories of the past, forever. And it's about time they created new and interesting models, with retro appeal, instead of just cheapening the legends of the original models with these endless, lazy reruns. I own zero re-releases, and have expressed similarly thoughts in the past on my blog about the pros and cons of them. So it was nice to know that others feel the same way. 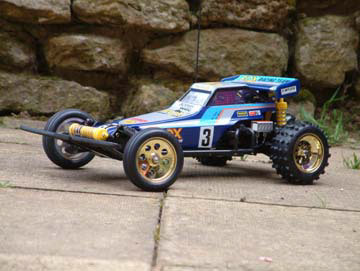 hi to everyone at Tamiya.Really to me it dose,nt matter what anyone thinks because to me Radio Controll Cars have been my thing since 1996 and at the age of 45 i still enjoy spending time in my workshop with my large collection of models i have built up since then and even though i have many different brands of models i could,nt resist owning a few Tamiya models like the Sandstorm nitro,Clodbuster to name a few.Iam not rich by any means and it has taken years to build up my collection but like many Rc Car fans out there this has been the most enjoyable hobby and something that is mine to enjoy.No matter if there are models which can not be got or like ye deciding to re produce some older models i think its a good idea.You are tops when it comes to quality models and thats why so many love your brand.Regards.KEN. I have just dived back into the model making recently. We bought with some friends of the pair of short course to have fun between us. However, I tried to find the feelings which livened up me when I received and builds my Marui Samurai or my Bigwig it more than 25 years. I thus decided to restore Bigwig and I saw that Tamiya rereleased his old buggy. I wish to buy those who please me most. 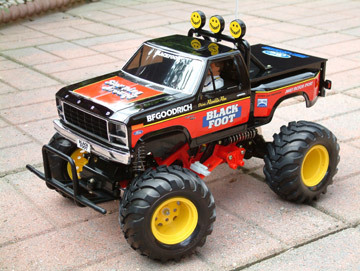 I am very happy that Tamiya rereleases the cars of my childhood. If you read the article again you will notice that it does elude to the dissapointment stemming not from a loss of value of a collection but a loss of the feeling of recreating and owning something rare, old and special. Most collectors (myself included) do not collect models with the intention of selling them on for a financial gain so really a de-valuation of a collection doesn't enter into it. I agree with you that these models are indeed at their best when running but there are enough vintage used models out there to enable this and indeed for many years we have been doing so. New built models or those restored from parts may well deserve to remain that way where a second hand used model can benefit from a lick of paint, some new decals and hit the sand dunes. I myself have many models in both shelf queen and runner form and indeed we have produced many DVDs and videos of these models in their full glory in use (which we have also been criticised for in the past). Thanks for expressing your opinion though and as i said right at the start of the article there really is no right and wrong and no correct answer because our underlying motivations and sentiments towards the hobby are varied. Well, I see you are full of grudge because the new re-released kits down valued your collection, although you denied it. You don't feel happy simply because the stuff you own are no longer "rare" and you blame Tamiya for financial greedy for re-releasing. Well, too bad for you "collectors". For me, RC has to be run. Otherwise it is no difference from static models which is far more detailed and scale looking on shelf. RC has its charm while it is in-motion, not on the shelf. I want to see how the suspension works when RC is running. Dust/sand/mud makes a RC more realistic. Leaving an Avante on the shelf just for the looking? Man you are humiliating these models. Running means: parts are important, and thats one of the advantages the re-releases gave us. Yes, replacement parts are manufactured last month instead of 1984, is made of super high tech plastic; but that doesn't make a vintage model less charm. When vintages models were newly released I was a kid. The only thing I could do was drooling over these pretty TAMIYA boxes and imagine what's side. Re-release model gave me a chance to fulfil the childhood dream and I believe it is the same for most people. No, I am not interested in buying super expensive used "vintage models" then hunt for "rare parts" on eBay so that I can put together a RC that is slow as turtle and disintergrates on first mis-operation. Re-releases are reasonably upgraded (which means they are compatible with modern electronics and eliminated some old mechanic problems) while being faithful to the originals, reasonably priced (too bad for your collectors as now you can't sell $5,000 for a vintage kit. Maybe you should have emptied your stock before re-release), and still looked good and classy. I think the re-released kits are great for older enthusiasts who want to relive their childhood memories and have a chance to own a model they lusted after as a kid but could never afford. I think its fantastic that Tamiya have "re-released" these models. As my dad is an aero modeller i had to spend hours on end as a child stood in model shops all over the country whilst my dad talked planes with the owners. Drooling over the array of Tamiya's finest was the only thing that kept me sane, or not some may argue. I could not afford these models as a child but i wanted them so badly. 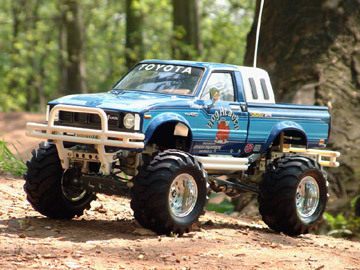 The Tamiya kits were always so detailed and captured my imagination at a glance. I built up a list in my head of the cars i wanted its only now over 30 years on and counting that i am starting to obtain that list. i have 10 of them with loads more i would like. Know some of the early models a hard to find and i run every one of the cars in my collection so if i get a re-realise or an original dose not matter that much to me as it will still have Tamiya's quality and detail. Also with all these superb kits hitting the shelves again hopefully it will capture other children's imagination and pull them away from there games consoles and mobile phones and get them out side having harmless fun again whilst teaching them about electronics and engineering at the same time. Now where is the harm in that? In my opinion the re releases are good thing, mainly as i couldn't afford the originals (i wasn't one of the lucky kids who's parents could afford/would buy them either) or they were released before i was old enough/born. Personally i've just bought the blitzer beetle, if they werent re relesed id probably never own one. They were one of the kits i have wanted since i was a teenager but by the time i had money to buy one they had been deleted and as id rather buy an unbuilt kit so i dont have to contend with badly built or damaged/abused parts, finding a nos kit would be difficult and most likely very expensive. same goes for the even earlier kits, they were originally made way before i was old enough to know about them, but id love a sand scorcher, no chance if the re-re kit hadn't came out, now that there out there i have a chance of buying one without paying a fortune for it. Firstly, top site guys!! I really appreciate what you have created. Id have to agree with you in that for me, having an original version on the shelf from my racing days and a re-release to whiz round the garden is the best in my opinion. Case in point - running round an original Subaru Brat and barely touched a fairly solid object and the plastics just disintegrated! Although it was a relatively easy fix, I had to replace original with re-release parts. If it wasn't for the re-release of these cars by Tamiya, it would be a lot harder and more costly for me to fix and replace the broken parts. Also, having a re-realease means that, if I do break something, I'm more removed from the car and it's not such a bad feeling of breaking something you've owned for 20 or so odd years. As for the re-releases killing prices of parts / kits, that i would have to disagree with. Having watched the ebay market drop during the initial re release of the Hotshot, I can now honestly say that the market has picked up back to before the cars were re-released. I've also watched the S/H prices of the re-releases steadily climb. I suspect that, like many people, when you sit down and work out just how much even a light restoration project will cost, a re-release is a better 'value for money' option in the long run. Cash permitting, and original restoration is a preference definately but once you have invested all this money into the restoration, do you really want to mess it up again by running it? Might as well get a re-release and have your fun with that instead. This is just my opinion and my own reason for owning both. It may not suit everyone. many of lifes wonderful obstacles but last year I saw a tamiya hornet kit ( which i had always wanted ) in the local hobby store and 5mins later i walked out with it under my arm. that were built to be raced, rolled and jumped. getteng a far out dated chassis but it is pure quality as has always been the case. A genuine vintage machine and thats all that should matter. Hi i think its a good thing on one side for the ones who couldnt buy them 1st time round and for the younger ones that are comeing into the hobby.And a bad thing for collecters like you guys here at tamiya101.Some models are rerelseases and some are sligty diffrent like the 2012 bruiser which has a all new 3spd gear on which the old one was allready made compltey new difs the wheels are the mountainer wheels.I think this debt will go on for some time.thanks for reading. I'd have to admit overall I am happy Tamiya having done the re-releases. While I can understand the frustration of a collector in seeing the value or idea of the older cars being diminished, I think a large part of Tamiya's market are people like me who are not necessarily avid collectors, but still want to re-live their childhood. I'm pretty sure that are a lot of people like me (we all seem to be around the 40-50s mark now) who wanted many cars as a teenager but could never afford them. So now thanks to re-res I have a new hornet, restored a hotshot, fox and wild one and not too mention the SRB's (just built me a buggy champ and will save up for some more!). And without the releases I doubt I'd have half these cars. Now I am also restoring a LB Celica and Renault and I have enjoyed immensely the hunt for parts, and for some reason this is probably where I'd draw the line on re-re (although in saying that Tamiya did do a release of the shell, which I am thankful for). Is this about money for Tamiya?, well they are a business and I'm pretty sure the re-res are a big market for them. But how far they can go will be seen, I would assume once guys like me have the cars we wanted as kids, then a large portion of the market will dry up, and they'll have to develop other products. The Bullhead is the nail in the coffin for me, none of the re-releases have hit as hard as this one has. Sure I had a original Lunchbox (my first NIB!) when I was young, but like you have said the blood sweat and tears to get the Bullhead second hand when I was a kid on paper run money, and the same blood sweat and tears over the past two years to restore my current one, well the re-release makes we want to biff my original off a cliff. Tamiya for the money, that's just silly talk. Who's in this hobby to make money? I do it because it's a link to my childhood, it's a memory of when I was young, it's something not many other people have. When it's finished, all the time and effort you spent finding rare parts, and restoring parts to acceptable condition, you look at it up there on display and realise it was all worth it in the end. That feeling goes out the window when it's available again at your lhs all parts inclusive NIB. I can appreciate the re-releases from the 'second time around brigades' point of view, infact, I have a few re-releases... but when ever somebody cries "No, I'm not happy about it" it seems the vintage community aren't allowed an opinion? Why not? Why cant I have my childhood memories left unmolested? I have to agree with you there mate. It was so much more fun to look for the right pieces, take your time polishing them, because you didn't have the rest yet anyhow. I have not bought re-re's. There just didn't seem any point. I've just gone to collecting the originals. About the first 30. Especially the Countach, Celica, 936, 935 etc. (no, not a 934 as yet). The ones with the metal chassis, Can Am Lola etc. About up the the 1983/84 releases. I also want them built, so no NIB's for me. I look at all the showrooms on tamiyaclub with people buying 3 of each model (one to run, one to shelf and one to keep NIB) and I don't really understand it. But each person is welcome to do what they want! I'm really greatful for ebay though. It has provided me with parts I would never ever have found in a million years. I hope you guys keep 101 running! It's great fun and I love the excellent pics of the VINTAGE models!!! !